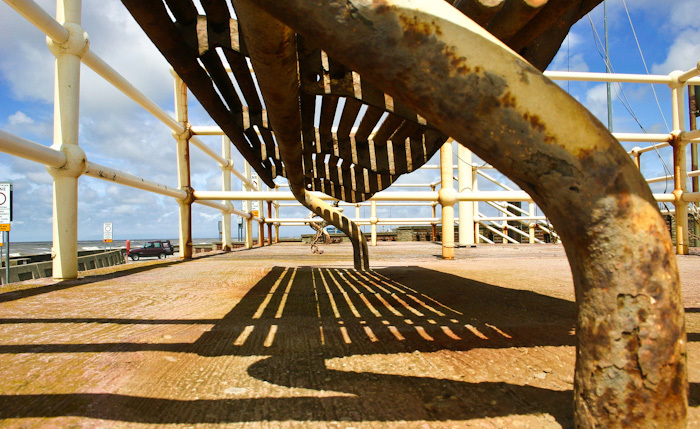 A shot of a bench at the seaside. What interested me here were the textures, the sharp dark/light relationships and the sense of the passage of time, expressed in the rusting steel and paint eruptions. This has been captured by taking the shot from an unusual angle, and I hope that looking at the subject in this way has helped focus attention on the poetics and sculptural qualities of what is there. This was taken on my third-string camera - quite an old one - and makes the point, I hope, that the number of available pixels need not matter much if you get other aspects right.